Conference program materials are often one of the last items to be checked off the event planner’s to-do list. With a very narrow delivery window, there is little room for error. What steps can you take to streamline the printing of your next conference program, avoid common pitfalls and increase the return on your investment? 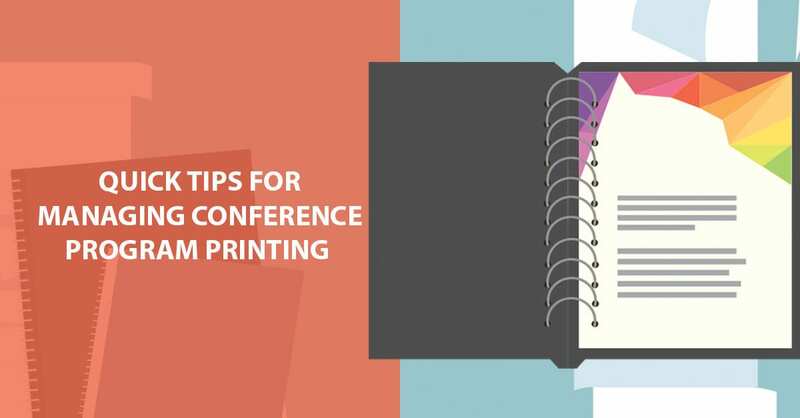 Take a look at this infographic to learn some quick tips to reduce the stress of your next conference program printing project. And for more ideas and advice, be sure to read our whitepaper, Managing Conference Print Projects: Five Tips for Success. You’ll get access to the knowledge we’ve gathered from printing conference content for over 40 years. These best practices and tips are the same ideas we share with customers to reduce the stress of this important part of conference planning. Conference print projects are often the last items to be checked off the conference planning to-do list. Keep these Four facts in mind as your conference program comes together to avoid any last minute surprises. A heavier-stock cover separate from the body pages adds expense. Save money by using a slightly heavier stock for the entire piece, including a self-cover. New technology has made conference program printing in full-color significantly less costly in recent years.